You can melt wax melts in a warmer. I like the Glade electric warmer best. The wax melts are small and the scent last between 8-12+ hours, so you can switch out scents frequently. I primarily purchase only a handful of brands. I like Glade, Better Homes & Gardens, Scentsationals, and Ten Digits Creations an indie wax vendor. You can find Better Homes & Gardens and Scentsationals for $2 for 6 little tarts at Walmart. I melted all Ten Digit Creations wax this week. I love TDC. There are other indie vendors out there I've tried, but TDC is the best in my opinion. They have the best quality, their TAT (turn around time) is super fast, and their customer service is amazing. 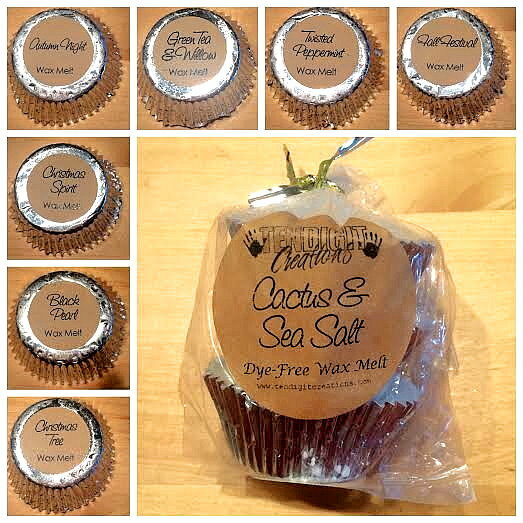 You can purchase their wax melts (they're dye free) in singles, doubles, 4 packs, 12 packs, or a big 14oz loaf. I typically burn a half or whole tart/melt depending on the scent. Here is what I melted this week! My Thoughts: I'm not hugely into sweet/bakery scents, but I adore this. I can really smell the caramel apples in this. It's sweet without being too much. I detect the pumpkin and leaf notes in this which tone down and round out the sweetness! My Thoughts: This a Bath & Body Works dupe. This is spot on. It's a sweet peppermint, but again not sickly sweet. The peppermint in this is STRONG. It will clear your sinuses. This is a great bright and knock your socks off scent. My Thoughts: Green Tea & Willow is a very fresh and green scent. I love clean scents like this, the clean/green scent is the high note in here with some subtle but nice sweet floral background. My Thoughts: This is another Bath & Body Works dupe. This is a great fall woodsy scent. It's spicy, dark, smoky, and rich all at once. This is masculine, but not really in terms of cologne, it's those woodsy and smokey notes that make me think masculine. My Thoughts: This is spot on Christmas scent to me. It's a very fresh and nature kind of Christmas smell. It smells like a fresh Christmas tree out in the cold winter air with hints of tart cranberry to round it out. There is nothing artificial or too strong about this scent. It's very festive, crisp, and inviting. One of my favorites! My Thoughts: This is a Lush dupe scent. This is the perfect bedtime scent to me. It's very soothing and calming. The chamomile note in here is strongest to me which I love. I adore this scent. I want to spray it on everything. The sugar notes in this really balances it out to be sweet (not candy or bakery sweet though) and soothing, not medicinal like some lavender scents can be. Another favorite here! My Thoughts: This had a very nondescript scent description, so I took a gamble. I wanted to like this so bad, but I sadly this isn't for me. This has a something what I think is a licorice note to it mixed with pine. It's just a combination that my nose does not agree with it all. It's too sharp and has a sweetness to that I didn't find pleasant. My Thoughts: This is another clean/spa scent. I like this one. It has strong watery and sea salt notes to it with a hint of green from the cactus. It's not the most exciting scent, but it's a great go-to clean and fresh scent that works year round. That's all I melted this week, which is a lot! I switch up scents every other or day and sometimes everyday. You can purchase all the ones I listed above on the Ten Digits Creations website. I know many of you are just nail polish readers, but I hope you will enjoy this. I hope I can turn some of you into wax addicts too!